There is the natural world and there is the world we’ve built on top of it. Urban life is a construct of incredible ingenuity designed to meet our human needs, sometimes on an incredible scale. Bridges, cranes, buildings, and towers populate our horizon, cast shadows on us, change our perception of the natural landscape. The work of Deborah Sibony and Anne Subercaseaux examines our interaction with the constructed world, one who hints at the marks we make on nature, and the other who uses fragments of intimate views. Their common subject, the Bay Bridge. We are thrilled to exhibit the work of these two accomplished artists in our office gallery. Thursday, November 2, 2017 | 5:30 - 7:30 p.m.
Join us in celebrating two local artists and their amazing work with an evening of great art, good conversation, and delicious food and wine. The more the merrier. Please share this event with friends and family. Monotypes are pulled impressions that are drawn or painted on a metal or plexiglas plate. The images are created through applications of ink that are rolled, brushed, daubed or otherwise applied and manipulated and then, an impression on paper, is “pulled” with the use of a press. For many years monotypes have been my medium of choice. The process provides a collaboration with the press that puts into question the end results. How much ink to apply to the plate, will a delicate line reproduce, how can I transfer a pattern? There are so many possibilities, challenges and suprises I enjoy and that keep printmaking fresh. Using a variety methods, I assimilate a progression of ideas. I use visceral properties of paint, the power of color, and a variety of mark making tools, drawing, photo transfers, and textures to create a composition. The visual language is primordial, melodic, and at times industrial. With each run through the press, the layers change and become more complex, history and memory become part of the conversation. An abstract reconstruction with the intention of leaving a path for the viewer to take. The relationship between architecture and nature continues to inform my work. The past few years I have been working on a series inspired by the gradual removal of the Eastern Span of the San Francisco Oakland Bay Bridge. As the bridge was slowly taken apart new dimensions of space and time appeared creating landscapes unique in their structure, elegant in their stature and balancing act — transitional landscapes which appeared just as quickly as they dissappeared. These prints hint at the marks we make on nature, what gets obliterated, and what remains in our consciousness. In her painting series, Reflections: on Crossing, Anne Subercaseaux explores the interplay of structural elements with cast lights and shadows. 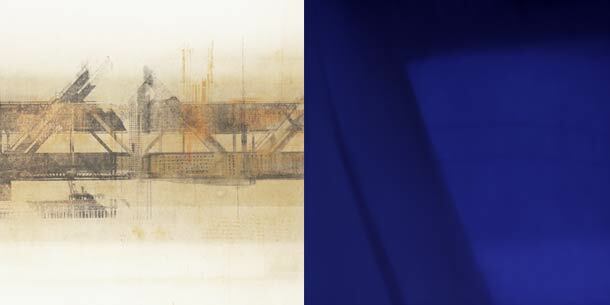 On her commute across the San Francisco Oakland Bay Bridge, she has observed the patterns cast from beams and cables onto the pavement surface. This abstract imagery she draws upon for her compositions. Studying the reflections allows her to focus on detail areas within a broader view, seeing the abstractions in closer proximity, the patterns amongst the road lines, and colors and textures of the concrete pavement. Anne works in oil, layering and moving paint with varied brushwork, and in the process, discover new forms related to the bridge. Working on each painting is a unique experience and challenge. In referencing the realistic imagery of the bridge, she explores other levels in the process - the space, light, quiet, motion and temperature - elements integral to her artistic experience. Anne's recent work comes from a view outside a small window in a medieval house in France. The lights and shadows cast from a fig tree onto a neighboring wall are a source for new imagery, the reflections providing ground for abstract compositions. Patterns evolve, reminiscent of camouflage, ikat and Asian designs. Working with these natural forms is in counterpoint to the structural imagery of the "Reflections: on Crossing" series based in the Bay Area. Presenting in combination, they represent the urban and rural imagery she experiences in both places.